Sound amplification needs to not only make sounds louder but more intelligible. A loud overhead sound system that no one can understand has no value. 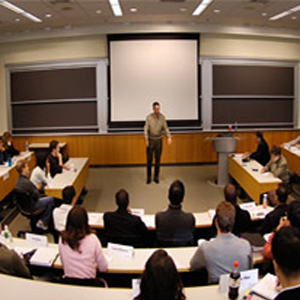 The effect of quality sound amplification for presentations and trainings is significant. Studies have shown that sound amplification in small- to medium size rooms can increase people’s retention by as much as 30%. • Attaching external speakers to a laptop, for example, will amplify music and video audio that is played from a laptop as well as from Skype remote callers. But it won’t amplify the presenter’s voice, improve intelligibility, accommodate speakerphones, or make it easy to use. • Purchasing a microphone, amplifier, and loudspeakers will make it easier to hear the presenter—particularly if the loudspeakers are properly placed in the room. But it won’t accommodate additional audio sources or remote callers. • Installing a feature-rich solution that provides microphones, loudspeakers, digital-signal processing, numerous input and outputs for audio devices, and a variety of control options will deliver excellent sound quality. However, it will probably cost upwards of $4,500. The illustration below depicts the basic components of a sound system for training rooms or presentation rooms. It is a system that is able to deliver rich, full sound. This system uses four loudspeakers to distribute audio throughout the room, creating a soundfield. It also includes a microphone with volume control, a control unit that interfaces with audio devices and provides volume control and device selection. Finally, the room module ties the system together and delivers audio signals from the various inputs to the loudspeakers. 1 The Meeting Room Marathon – A Waste of Corporate Time, Dynamic Markets research commissioned by Casio, July 2010.